“The costumes, the scenery, the make-up, the props...” Susan Pearlman, Debbie Bourque, Les Rogers, Lisa Markman, and Fred Hall. 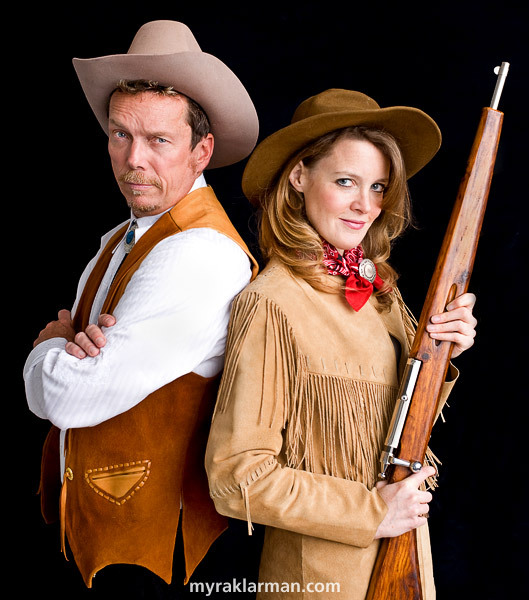 The Burns Park Players have just finished their penultimate performance of this year’s show, Annie Get Your Gun. Last Friday, I caught opening night with Rico and my in-laws. Roger LeLievre wasn’t exactly tightfisted with the praise in his glowing review for the Ann Arbor News. Tomorrow, we’re taking Max to the 4pm matinee. 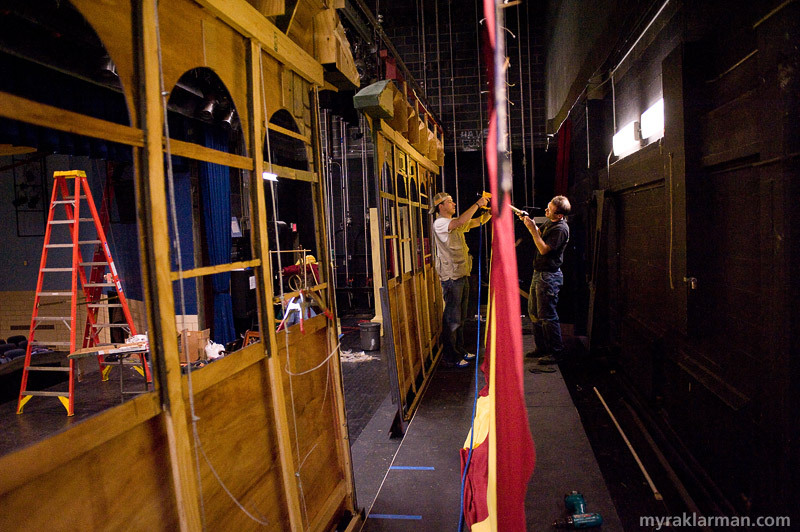 He’s already pretty familiar with the show, having twice visited Tappan during the rehearsal/set-building phase (and inveigled his way into various crew jobs). Also, we’ve been singing several of the songs pretty much non-stop (tonight’s lullaby was “You Can’t Get a Man with a Gun” in two-part harmony). 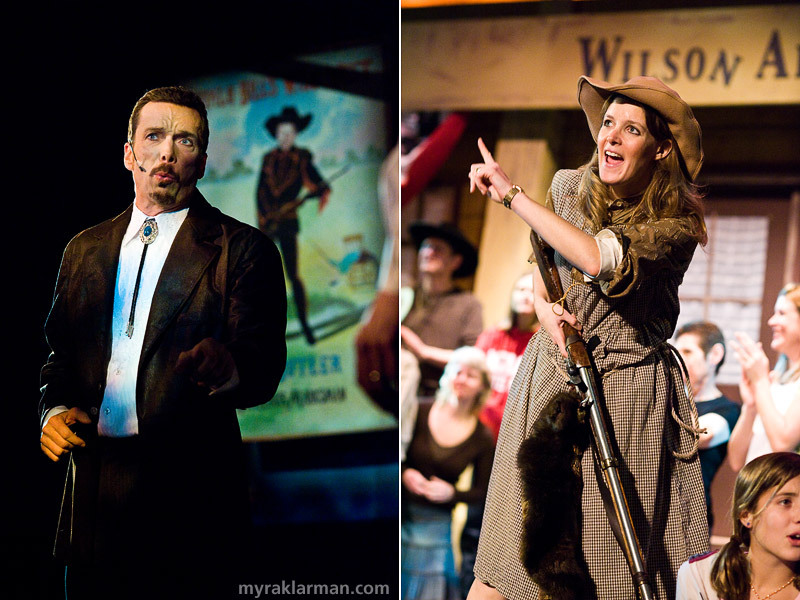 A month before opening night: I loved working on the publicity photo with Eva Rosenwald (Annie Oakley) and Jeffrey Post (Frank Butler). Less than a week to opening: Jeffrey and Eva in rehearsals. Sets designer Curtis Green and sets crewhead Jim Wallace attach letters to the big-top tent. 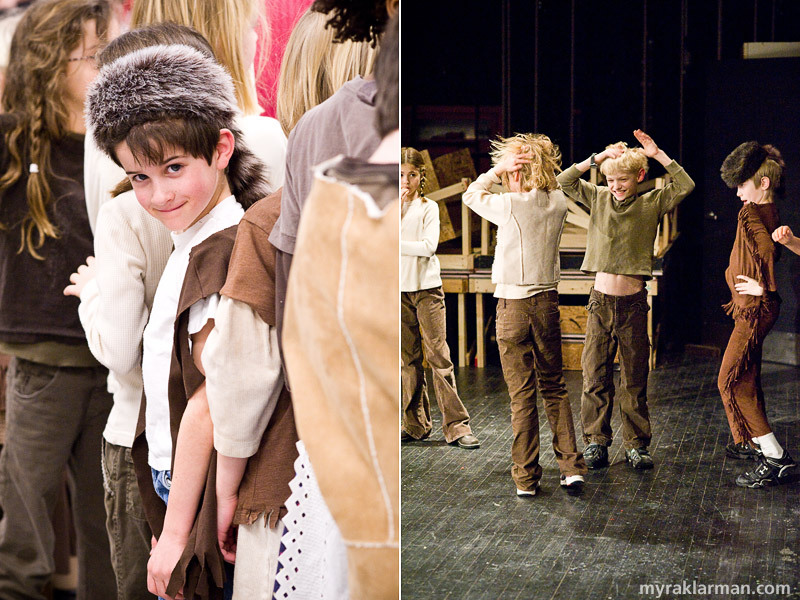 First through fifth grade students at Burns Park Elementary School make up a large portion of the ensemble. 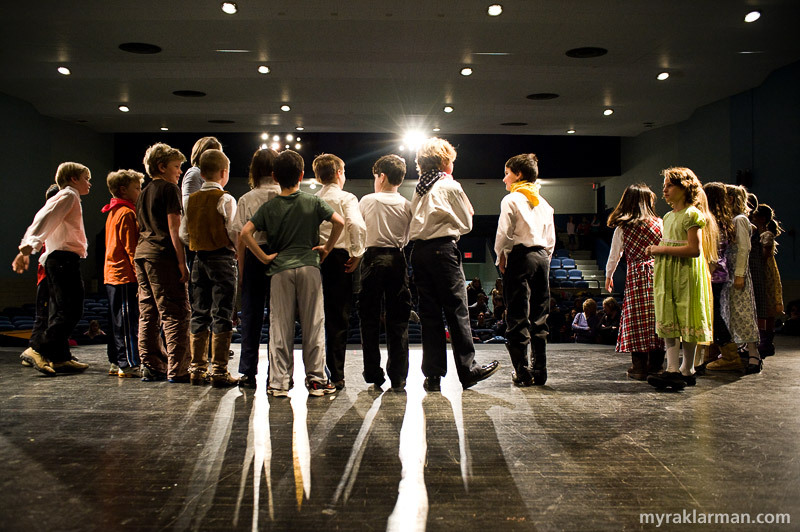 The kids aren’t on stage for very long, but threaten to steal every number they’re in. 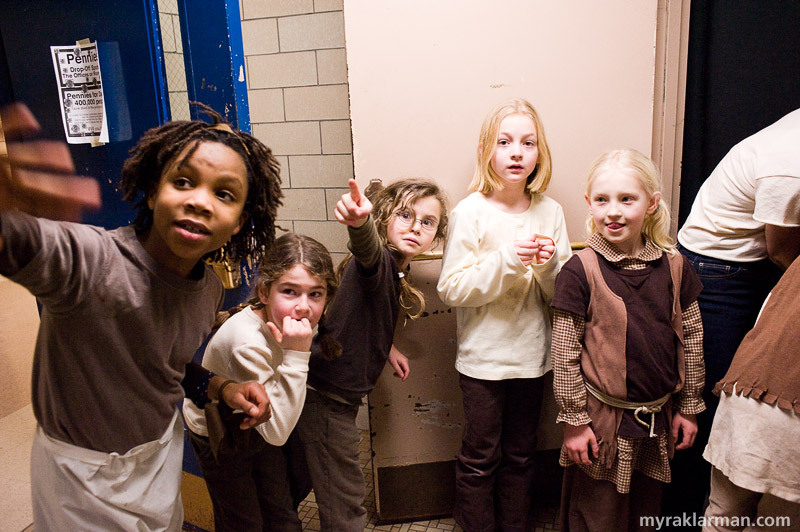 Second grade girls awaiting their cue in the stairway spot Annie offstage. Some Burns Park Elementary alumni maintain their connection to the Burns Park Players, returning to play older kids: Annie’s siblings now attend Tappan Middle School, and Winnie now attends Pioneer High School. 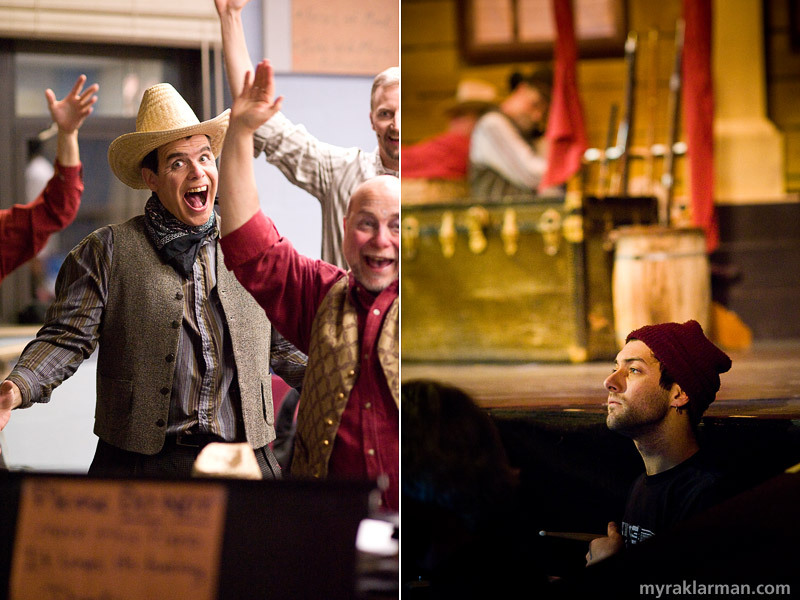 Cast members warm up in the music room. | Orchestra member Pat Schrock in the pit. 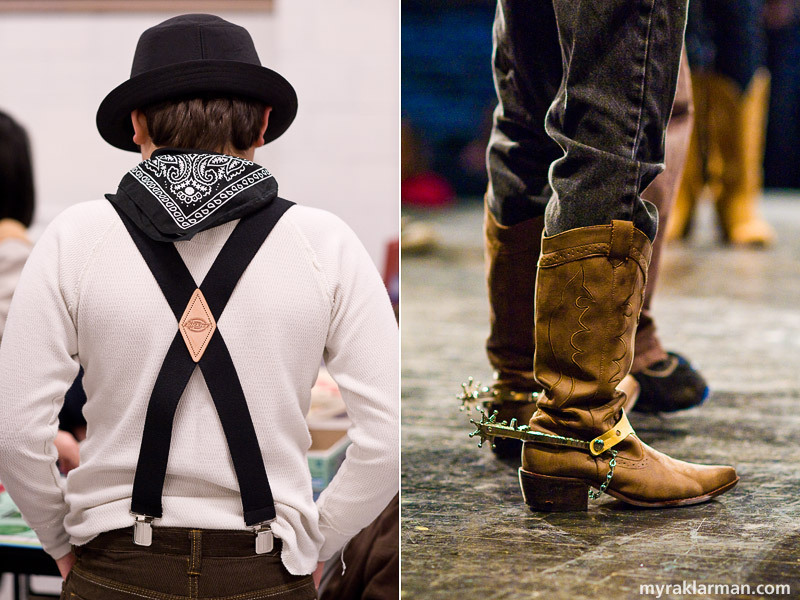 Hello Myra, I was the designer of Annie Get Your Gun and I was hoping I could get some photos of the set from you if possible. I am putting a portfolio together and would love some of your beautiful photos to be in it. The photos are truly wonderful, you are very good at what you do. Thanks. 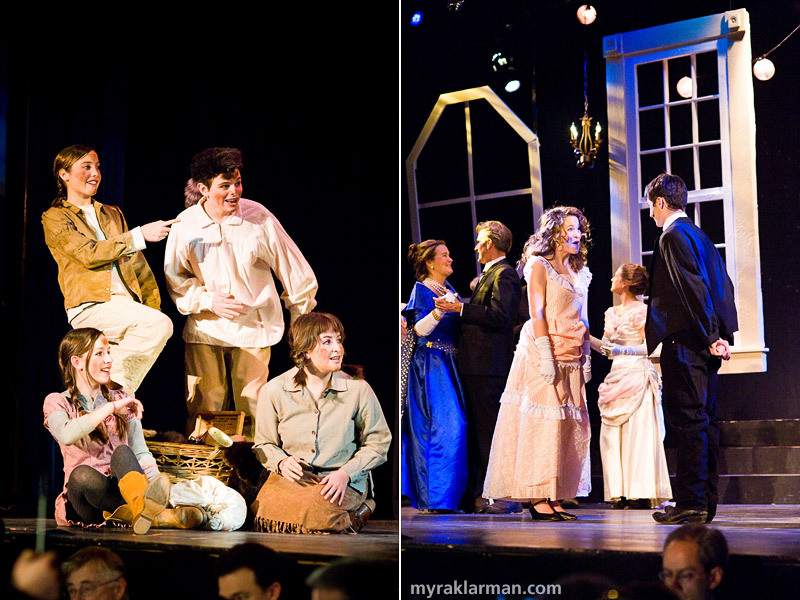 My high school is doing this play—great job, I enjoyed looking at the photos and recognizing scenes.